A rarity in exile, the Acadians exiled to Pennsylvania were allowed to practice their religion. William Penn founded Pennsylvania with a land grant that was owed his deceased father. His goal was to create a colony that allowed for freedom of religion due to his desire to protect himself and fellow Quakers from persecution. In other colonies the word went out that priests were forbidden to go near the Acadians - if they did, they would be imprisoned or put to death. The same fate awaited the Acadians. To assure there would be no priests available, the priest in Acadia when the deportation began were all deported to France. In Philadelphia the Acadians worshiped at St. Joseph's Church where Father Farmer was pastor. I visited the church several times when doing research in Philadelphia. 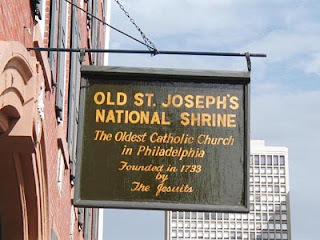 Today it is known as Old St. Joseph National Shrine - The oldest Catholic Church in Philadelphia founded in 1733 by the Jesuits. Father Farmer's marriage registers have been transcribed and I received permission to post to my web site. There are Acadian marriages in these registers. The registers are now located in the archdiocesan archives and elsewhere. The transcribed registers can be found on the Acadian & French-Canadian Ancestral Home web site. I wonder if the Ives LeBlanc who in 1797 painted the waterfront of New Castle Delaware (20 miles from Philadelphia) is of Acadian origin? but I know nothing about where he was from or about his other works. I have no evidence he lived in New Castle, a town variously ruled by the Dutch, Swedes, Dutch, English courts, then Quakers, always with remarkable ethinc (though not racial) diversity, religious freedom and lack of blodshed on takeovers. Does anyone know of an Ives Le Blanc (or LeBlanc) a painter c1800? Hi Jim..I've no idea. Many people went to Philadelphia from France and that may well have been the case with Ives Leblanc. Thank you for your post. Something to look into along the way.